If you’re visiting soon, then you’ll need an awesome route. Below is our 3 week Sri Lanka itinerary which will ensure you don't miss out on anything! In September to October, we spent just over three weeks in Sri Lanka exploring everything the country has to offer. It’s a FANTASTIC country that provides you with cultural delights, beautiful beaches and glorious mountain ranges and waterfalls. It truly has it all. The great thing about Sri Lanka is that due to its relatively small size, it’s easy to see all the best things in Sri Lanka in three weeks. Below we go through our 3 week Sri Lanka itinerary to make sure you don’t miss out. I promise that after you leave this country, you’ll want to return ASAP and please invite me with you. Let’s start with the basics, getting a visa to Sri Lanka. It’s a requirement for most citizens and it’s a fairly fuss-free and easy process that you can sort prior to your stay. The Sri Lanka visa works on an ETA basis (electronic) and you make the application online here. It takes a few minutes and it grants you 30 days into the country which can be extended in Colombo for up to six months. Nationals from Singapore, Maldives, Seychelles. The Sri Lankan Visa costs $35 dollars for 30 days and you pay online. You don’t need to print anything off as it’s all linked up to your passport. (I know this because I printed stuff off and didn’t need it). The SAARC countries are $20. If you love the country as much as we did (we wanted to stay longer but time was a constraint) then you can, of course, extend your visa. You can do this in Colombo and it takes a couple of hours. The fees for different countries are as follows. Okay, so now that we’ve got you into the country, we can get started on your amazing route. Below I’ve included a picture of our specific route for your convenience. The best and most obvious place to start any Sri Lanka itinerary is from Colombo. This is because you will fly into Negombo. So whether you are heading north or south or even east, you can check out the capital city first. 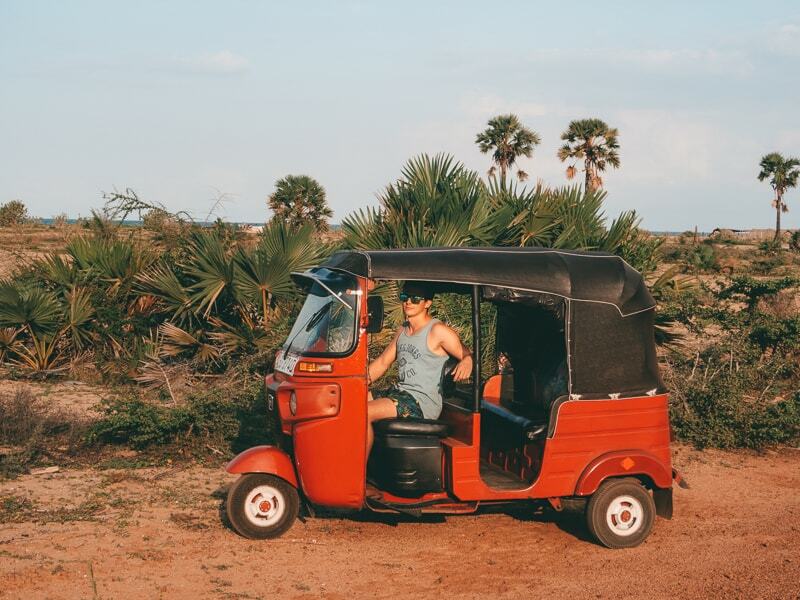 Please note that we rented out our own Tuk Tuk with a fantastic, reputable company (the reviews speak for themselves) to fulfil our three week itinerary in Sri Lanka. We found this was the best way to see the country, engage with the locals and get off the beaten track. An amazing experience that we go into detail here. This route goes north first, and if you’re wondering why, it’s due to the time of year. 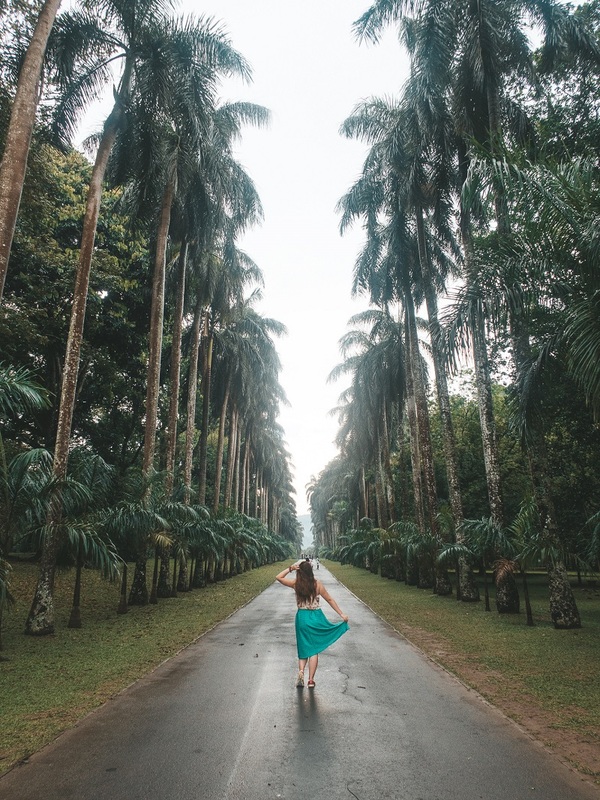 The monsoon is split between two in Sri Lanka, so follow our Sri Lanka itinerary then you’ll get the best weather in all the destinations and avoid most of the monsoon. Colombo is the capital of Sri Lanka and there is some debate on whether it’s worth stopping. I think yes. It gives you a chance to gather any information about the country, it also gives you the chance to extend your visa, apply for a driving licence (if you’re driving a tuk-tuk). Plus there are some things to do in Colombo. There is a little “European street” that offers a variety of modern restaurants from around the world, such as Spanish tapas, French, Indonesian and much more. It’s a nice place to celebrate your first night Sri Lanka. Our next stop was a safari experience. I researched many safaris in Sri Lanka and this was my favourite because of the high chance to see leopards. In the end, we didn’t see any, but we saw lots of other great animals (including my favourite- elephants!) 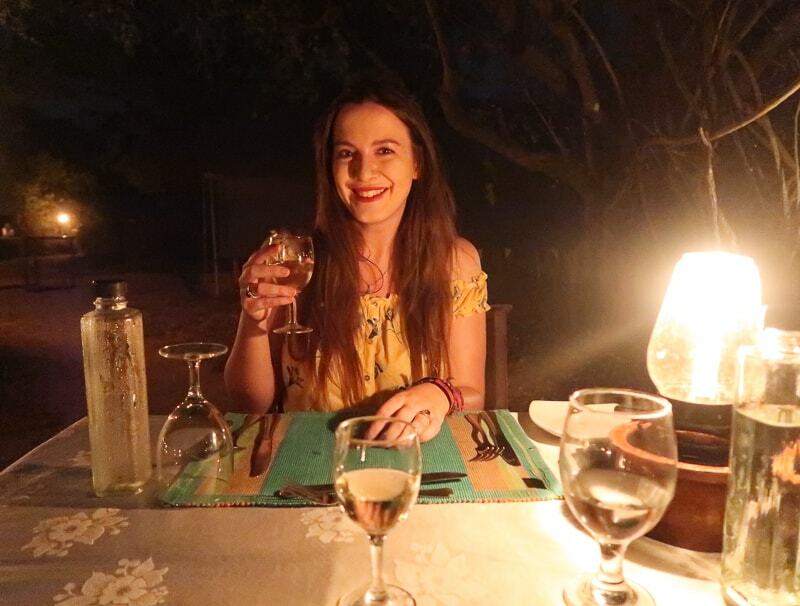 and the safari camp we stayed in was amazing. You got to dine underneath the stars. You only need one night to do the safari experience. Check out my guide for booking a safari in Sri Lanka. 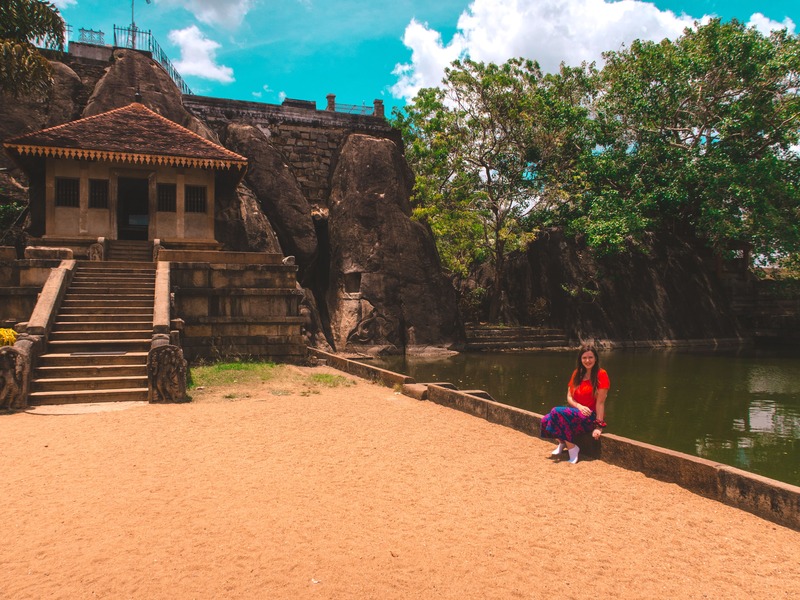 The next stop on this Sri Lanka itinerary is the cultural capital of Anuradhapura. It’s filled with lots of temples, stupas and historical sights, so you could easily spend a couple of days discovering this city. Trincomalee is your first taste of the coast and it’s beautiful. It's a great spot for whale watching. A 2-night stay is definitely a good idea, and we would head early from Anuradhapura (it’s only 2 hours away) to get a full day of sun. You could easily spend longer, but in the interest of a three week itinerary for Sri Lanka, 2 nights in enough. Sigiriya is famous for its Lion Rock, the world heritage site and it’s one of my favourite places in Sri Lanka. 1 night is definitely enough here as there’s not that much to do. You can do both rocks climbs in one day. You can also pop to Dambulla and visit the Rock Cave Temple their too! Now we are heading towards the hill country of Sri Lanka. 1 night in Kandy is enough to see the royal botanical gardens, temples etc. Just head out early and you’ll get it all! The drive from Kandy to Nuwara Eliya was great, as you can stop at so many amazing tea plantations for super cheap but delicious tea. You can also get the “famous” train ride from Kandy to Nuwara Eliya. 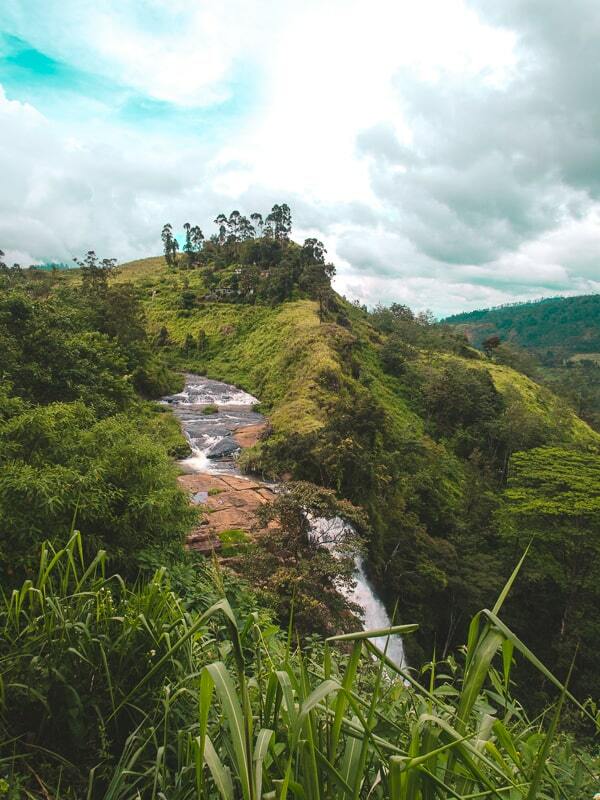 There are lots to do in Nuwara Eliya, including fabulous waterfalls. But you also need a day to go Trek Little worlds end at Hortons National Park. It’s colder up here, which is one of the reasons why it's known so affectionately as little England! Ella is amazing and without a doubt one of the best place in Sri Lanka. Regardless of your final Sri Lanka itinerary, you should include Ella on it. Amazing hills and mountains to climb, beautiful scenery and a great atmosphere of bars and clubs. We are heading back to the beach! Arugam Bay is famous for its atmosphere and it’s surfing. 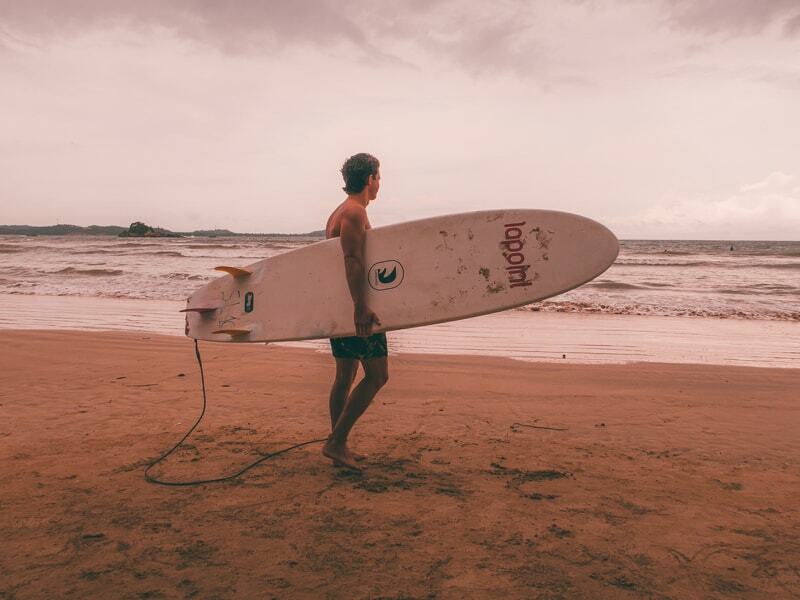 It’s a perfect place to meet other travellers, party and learn to surf. You could spend ages here getting into the laid-back lifestyle, but three to four nights is a good amount. (Especially if you don’t surf). Three nights also gives you a chance to visit nearby Yala national park. 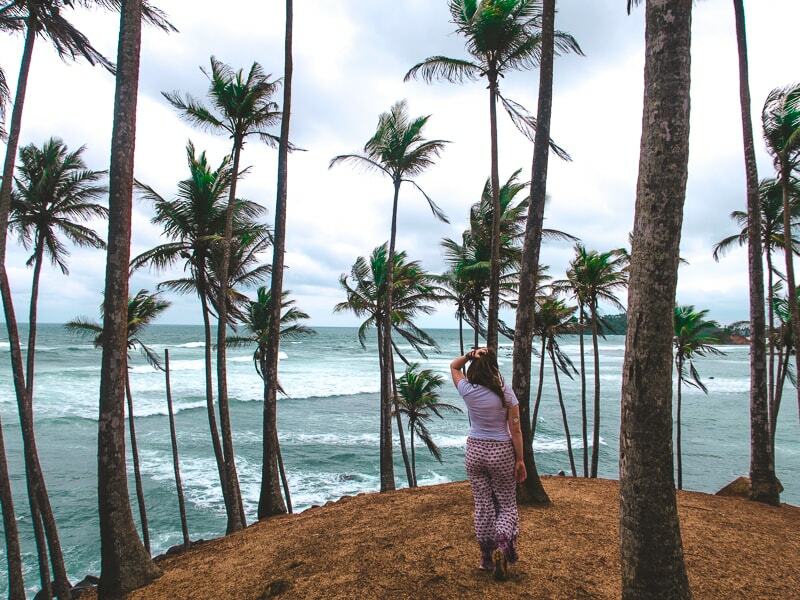 Mirissa is the south of Sri Lanka and a perfect place to surf, relax and even party if you wish. It’s got beautiful beaches and cheap cocktails and a great place to just take some time off. You can learn to surf here too, excellent beginner waves. Mirissa is close to Udawalawe national park which you can visit too if you haven't done a safari yet. 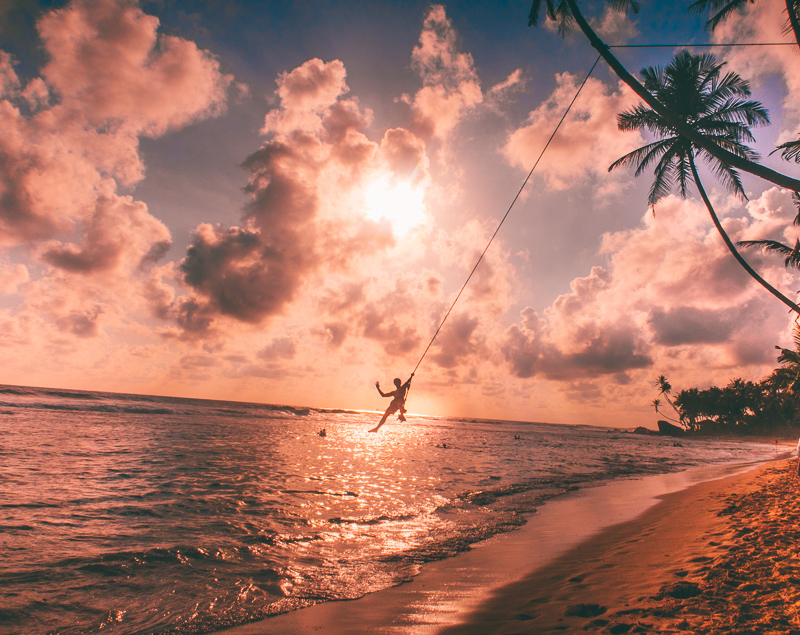 Unawatuna is another popular tourist area because it has some of the most beautiful beaches in Sri Lanka, a surfers paradise, and filled with amazing shops and cafes. It’s also 20 minutes from Galle which is another great place to visit, but not worth staying overnight. You could do more nights in Unawatuna too if you had time. The end of your journey is here. Stay in either Colombo or Negombo to gain easy access to the airport before your flight. TOTAL: 21 days = Three Weeks! I will be totally honest and say that Brad and I were in Sri Lanka for almost four weeks, but, that’s because we were in Arugam Bay longer (waiting on the arrival of a new laptop being delivered to us) and we went to Mullaitivu in the North, which was so bad and pointless that I did not bother including it on this list. We were hoping to find out about the war, that’s why we went, but it’s truly not worth it. Getting from each place doesn’t take too long, so it’s easy to stick to this 3 week Sri Lanka itinerary. 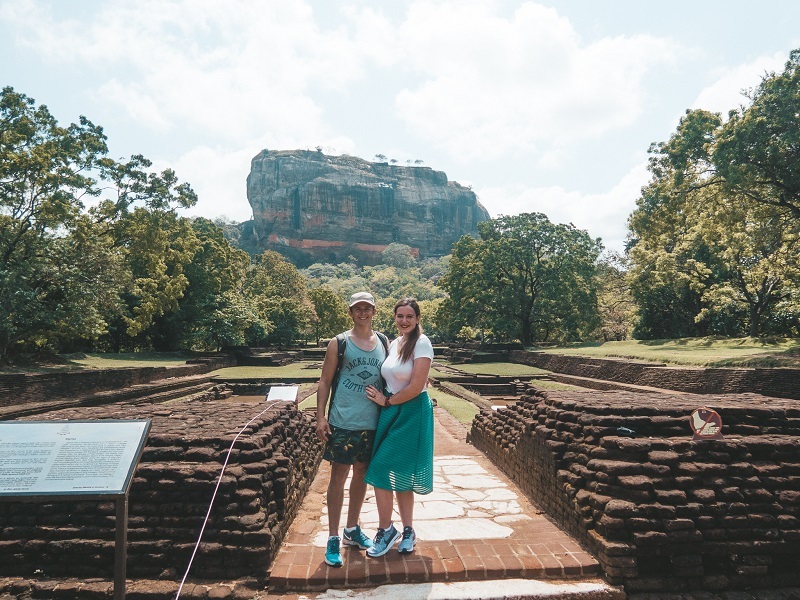 This Sri Lanka itinerary allows you to see what I believe is the best of Sri Lanka in a relatively short period of time. You could easily stay longer, but if you have only 2 weeks in Sri Lanka, then it’s best to stick to just one region, such as the South East, don’t try and squeeze everything in. There are of course other places to stop, but this 3 week Sri Lanka itinerary takes you through the best. Now that you’ve discovered a great backpacking Sri Lanka route, you’ll need to know how to get from place to place. You can easily navigate Sri Lanka via bus, train and taxi. Train travel is regarded as the most beautiful way to travel through the hill country, and it’s one of the cheapest forms of travels. Taxis aren’t overpriced for the distance you are going, so they’re good for people who prefer the convenience and air conditioning! You can also take a private car with a private driver, but of course, this will be costly, it just all depends on your overall Sri Lanka budget. But, I personally think the best way to travel is via your own tuk-tuk. It’s an experience like no other, and how many people can say the drove through a country in a tuk-tuk. It was super safe, I felt safer in my tuk-tuk than a taxi! The company we went with is the only official one, and they offer insurance, driving lesson and so much more, and you can easily see from the reviews that not a single person has had an issue. If you want to explore more of a country, more than every other tourist sees, then this is the way to do it, plus you get to drive through national parks where you can see elephants on the road! For almost every destination listed here, I have linked through to our awesome travel guides, which goes into detail about the best things to do in the destination and how to get to them. A suggested budget for Sri Lanka? If you're wondering about your 3 weeks in Sri Lanka budget, then you'll be happy to hear it's not expensive. If you stick to buses, trains, or tuk-tuk rental, your transport will be cheap. Hotels, guest house, hostels are all cheap and good value and there is something to suit everyone. Food is also crazy cheap, and in places in Mirissa, alcohol is great value. The most expensive things will be your entrance to world heritage sites or safari days, but these costs are all worth it for the experience. Our Sri Lanka itinerary takes you through all of the countries. It doesn’t focus on one area, such as the hill country, or just the beaches. It gives you a chance to see the whole country and the wonderful contrasts between the different areas. When I go to a place, I want to experience it all and I feel like I didn’t miss out on anything with my travel route. Like I mentioned before if you’ve only got two weeks in Sri Lanka then stick to one area so you don’t rush everything and miss out. I would suggest sticking to the hill country then hit some of the beaches: for examples, Colombo>Kandy>Nuwara Elyia> Ella> Mirissa> Unawatuna. If you are doing 4 weeks, (like we technically did), then you can afford to stay in some places a little longer or to stop at a few more places. You could also head to the very North of the country which is Jafna. In case you're wondering what cameras we used for these photos. Canon G7x Mark II: Brilliant little point and shoot, video recording for creating travel videos and vlogging camera. Good for quality photos and keeping your equipment light. Tripod: We carry a travel tripod to take some pictures together or get unique shots. Memory cards: I use 64G sandisk, and carry about 6 in a box. Always back stuff up to a harddrive! Mavic Pro Drone: Our baby mavic is high quality, worth a lot of money and worth it for the beauty it captures. There are more new drones out, but this is honestly perfect. 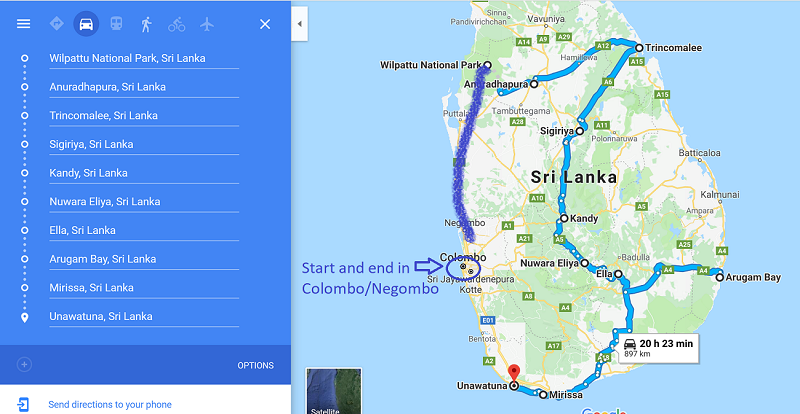 So there you have it, my 3 week Sri Lanka travel itinerary. 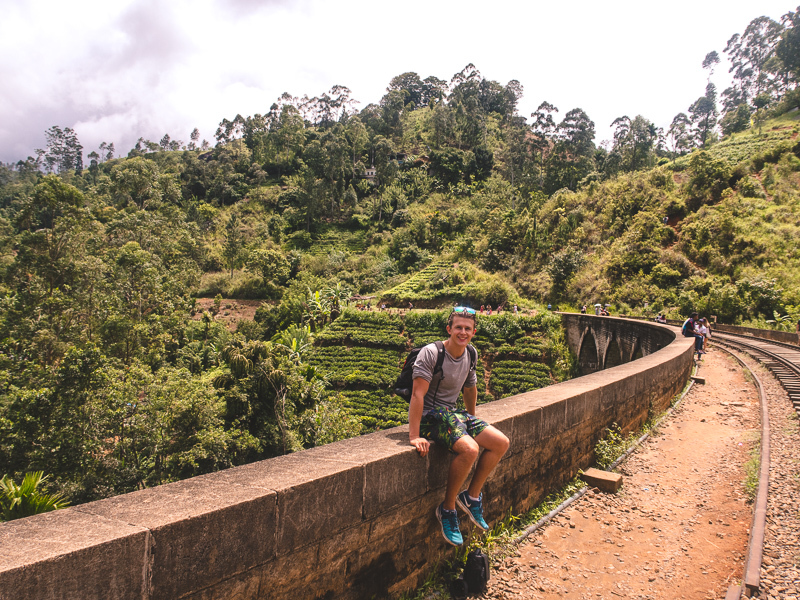 I hope you’ve enjoyed it and I hope it gives you a rough idea of a route to travel when planning your Sri Lanka adventures. 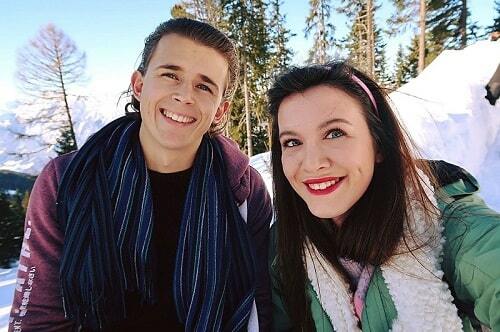 I hope you have an amazing trip and comment below with any more suggestions!